From a collaborative effort of the Center for Chemical Process Safety (CCPS) and the Energy Institute (EI) comes an invaluable book that puts the focus on a specific qualitative risk management methodology – bow tie barrier analysis. The book contains practical advice for conducting an effective bow tie analysis and offers guidance for creating bow tie diagrams for process safety and risk management. Bow Ties in Risk Management clearly shows how bow tie analysis and diagrams fit into an overall process safety and risk management framework. 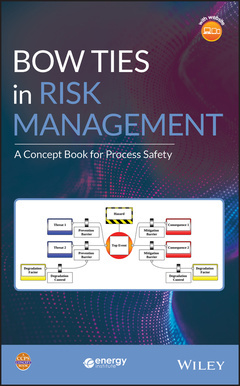 Although this book is written primarily for anyone involved with or responsible for managing process safety risks, this book is applicable to anyone using bow tie risk management practices in other safety and environmental or Enterprise Risk Management applications. It is designed for a wide audience, from beginners with little to no background in barrier management, to experienced professionals who may already be familiar with bow ties, their elements, the methodology, and their relation to risk management. The Center for Chemical Process Safety (CCPS) has been the world leader in developing and disseminating information on process safety management and technology since 1985. The CCPS, an industry technology alliance of the American Institute of Chemical Engineers (AIChE), has published over 100 books in its process safety guidelines and process safety concepts series, and over 10 training modules through its Safety in Chemical Engineering Education (SAChE) series. The missions of both the CCPS and EI include developing and disseminating knowledge, skills, and good practices to protect people, property and the environment by bringing the best knowledge and practices to industry, academia, governments and the public around the world through collective wisdom, tools, training and expertise. The CCPS has been at the forefront of documenting and sharing important process safety risk assessment methodologies for more than 30 years. The EI's Technical Work Program addresses the depth and breadth of the energy sector, from fuels and fuels distribution to health and safety, sustainability and the environment. The EI program provides cost-effective, value-adding knowledge on key current and future international issues affecting those in the energy sector.